Thanks so much for joining in the Pinkfresh Studio Let Your Heart Decide Blog Hop! The new PF collections are all amazing and the Design Team will be featuring each collection over the coming weeks! You should have arrived here from Anna Kossakovskaya's Blog. 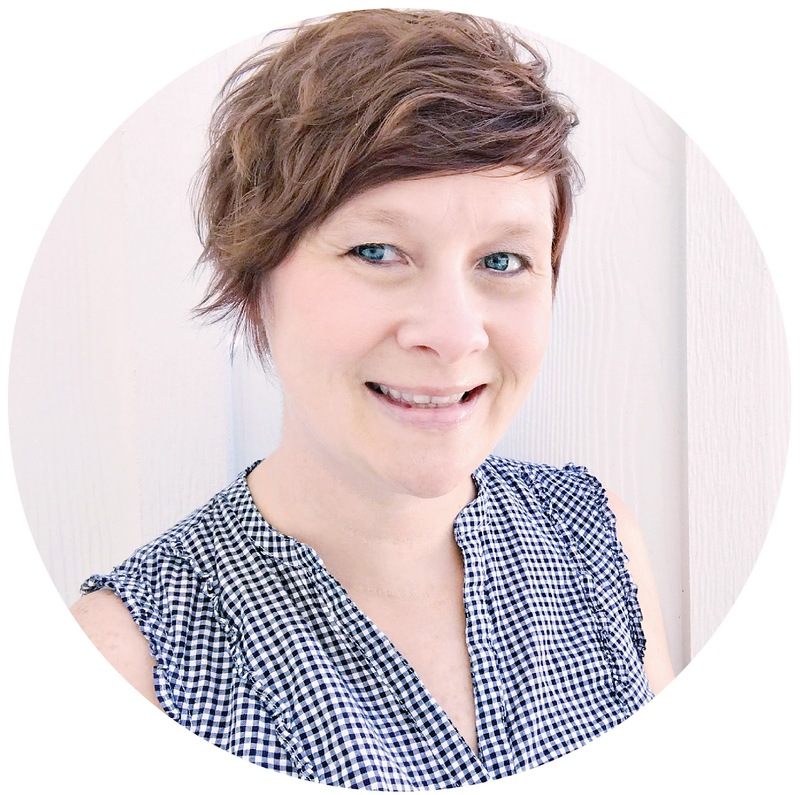 If you're just now joining the Hop, you can go to the Pinkfresh Studio Blog to start from the beginning. I created two layouts using the Let Your Heart Decide collection. I had a hard time deciding what products to work with from the collection, because it's all so beautiful! 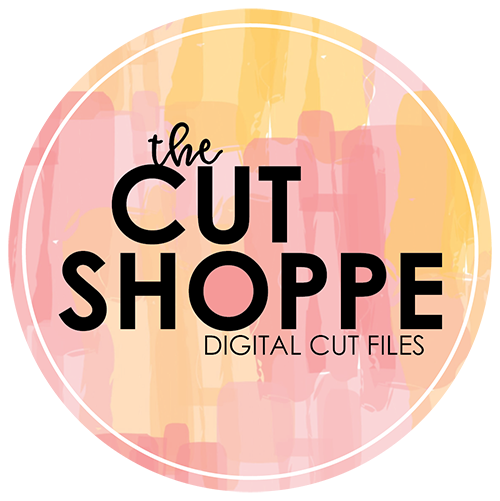 You can find more inspiration using the collection, by visiting all of the DT Blogs. Next up is Beata Valint. In case you need it, here's a full list of the Hop order. Don't forget about our GIVEAWAY! 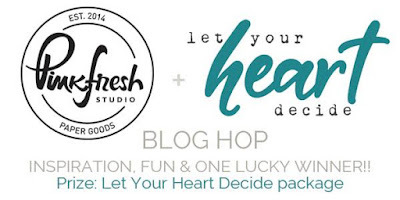 You can win a Let Your Heart Decide prize package by leaving a comment on each Design Team member's Blog. Comments will close at 11:59 PM CST on Thursday, February 1st, 2018. A random winner will be announced Saturday, February 3rd, 2018. These layouts are so amazing. Cannot wait to be able to get the new items. Your pages are beautiful and so detailed! And such a breath-taking collection! Oh, I just L*O*V*E the beautiful design of the first layout. It's stunning! Great showcase of this awesome new collection. 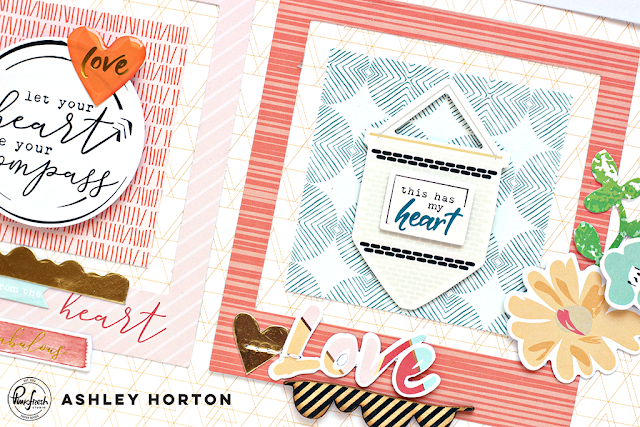 Love love love the quilted look of the first layout. As the daughter of a quilter I started my crafting life quilting and it will always have a special place in my heart. Stunning layouts! Love the design and stitching on the first one in particular and the blocked look in the second. That first layout is absolutely stunning!!!! 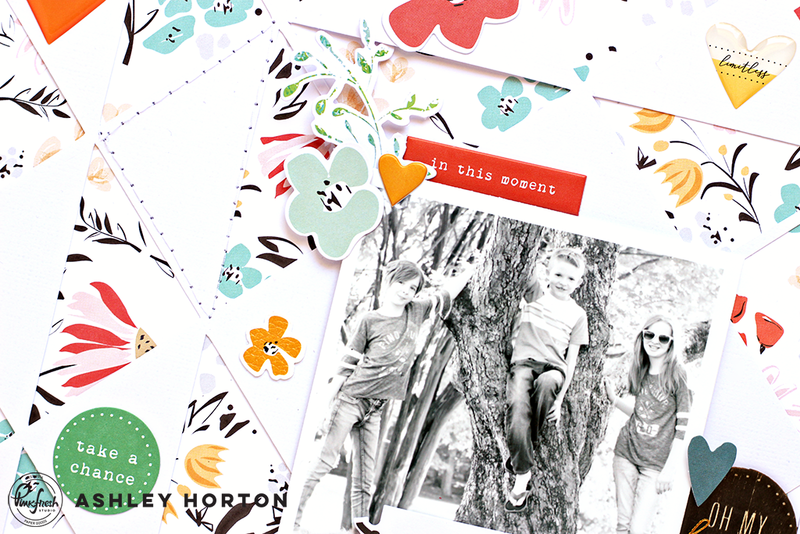 Love your layout - super creative!! It’s so neat how you’ve Made that quilted effect! It’s unusual and beautiful! You are the queen of patterned paper Ashley! wow! what an intricate layout! I don't know how you chose just a few products to use either! I love all of it too! I love how you used just ONE pattern on that first page but still made a big impact on the background! The first layout is so stunning and the second one is so cute ! Awesome layouts! I love the first one with such pretty layers and textures! 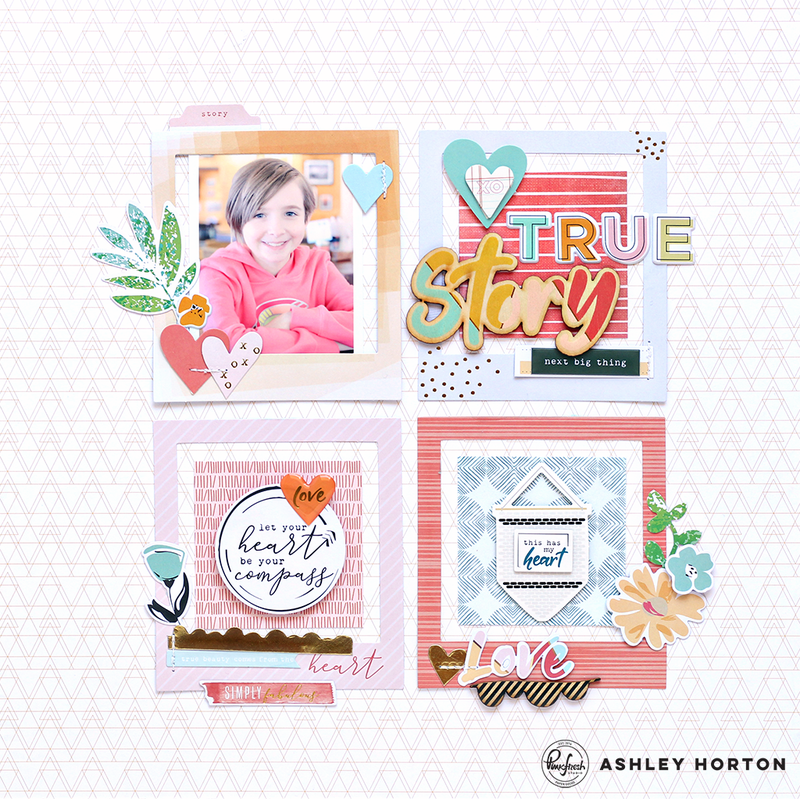 Pretty effect on your second page with the frames and embellishments! 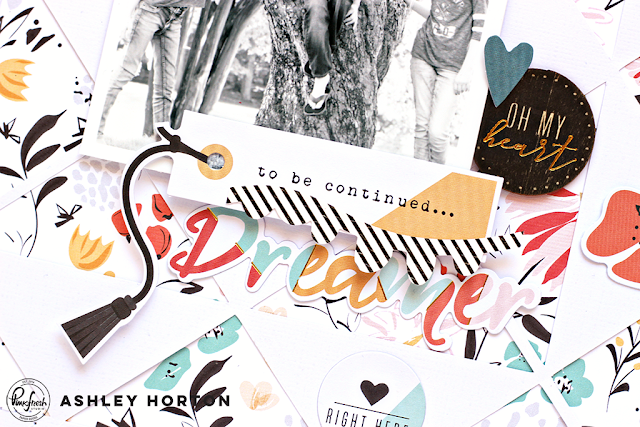 This collection has my heart.....love what you did with it! Love all your little details (i.e. stitching), b&w photo, frames, puffy stickers....be still my heart. LOL! Really love that first layout with the quilt type design. Very pretty. Your creations are so beautiful !! Both layouts are fabulous with this collection. I like the stitching on the first one. These are so pretty. I love the elements you chose and their arrangement. Wow, you did an amazing job with all those lovely products! I just love a grid & this one is beautiful! Ashley, your layouts are wonderful!! from the colors of the background. Love the design of the pieces. Ashley, I too love to use black & white photos with colorful embellishments, that way, both elements really pop. This collection rocks!! Wonderful pages. So colorful and fun. Love these layouts, especially the first - the frames within frames is a wonderful design! Beautiful pages. My favorite is the second one. absolutely LOVE the combination of colors! These are wonderful creations ! Your pages are so lovely and just beautiful! There is so much detail and it's just fabulous! Thanks for sharing! Wow! This quilt design is stunning!